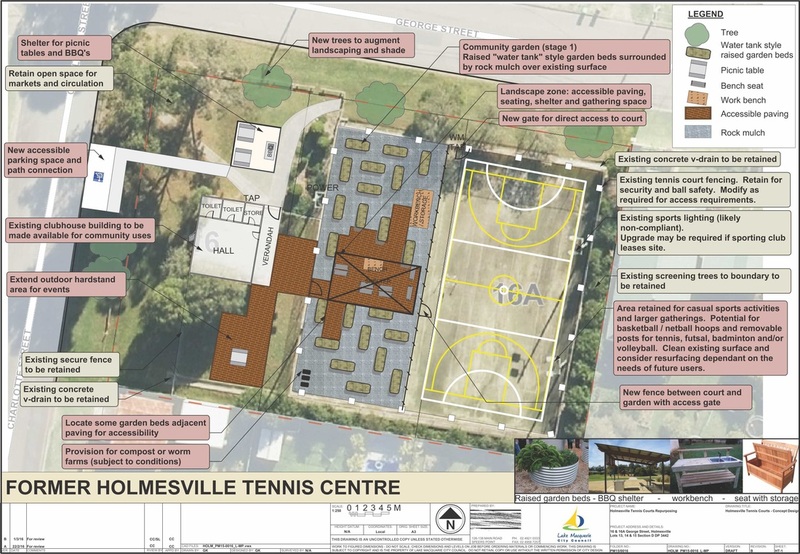 Today our group was handed the keys to the disused tennis courts at Holmesville for the purpose of transforming the site into a community garden. 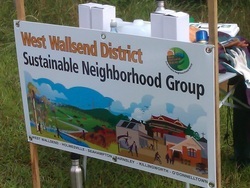 The creation of a community garden was high on the list of facilities that the community wanted when West Wallsend District Sustainable Neighbourhood Group was formed, and we see that the re-purposing of this site is a perfect example of why our group was formed. Not only have we saved a valuable space from further degradation, we have the potential to transform the site in to something that the whole community can be a part of. An operating committee has been formed to begin development of the gardens and we would like to invite all members of West Wallsend District to come on board this exciting development. A concept plan has been approved so that we have something to begin with. The West Wallsend District Sustainable Neighbourhood Group is encouraging residents to report illegal dumping and help protect their local bushland. Council’s Acting Manager Sustainability, Dean Chapman, said the Group has been working with Council staff to develop an education pack, containing a fridge magnet and information flyer, to increase reporting of illegal dumping and promote the EPA’s new online reporting website, www.ridonline.epa.nsw.gov.au. “The Group initiated the project to inform community members of what they can do if they witness dumping or find dumped items, and to send a clear message that illegal dumping is not acceptable anywhere in our City,” Mr Chapman said. “Volunteers will be delivering the education packs to households in Barnsley, Holmesville, Killingworth, Seahampton and West Wallsend over the next few weeks. Inaugural Old Waste New Art competition wins community award. We were surprised and thrilled to have been chosen as winners of the 2016 Lake Macquarie Australia Day award for Community Event of the Year. This was especially pleasing as 2015 was the first year that the competition had been run. 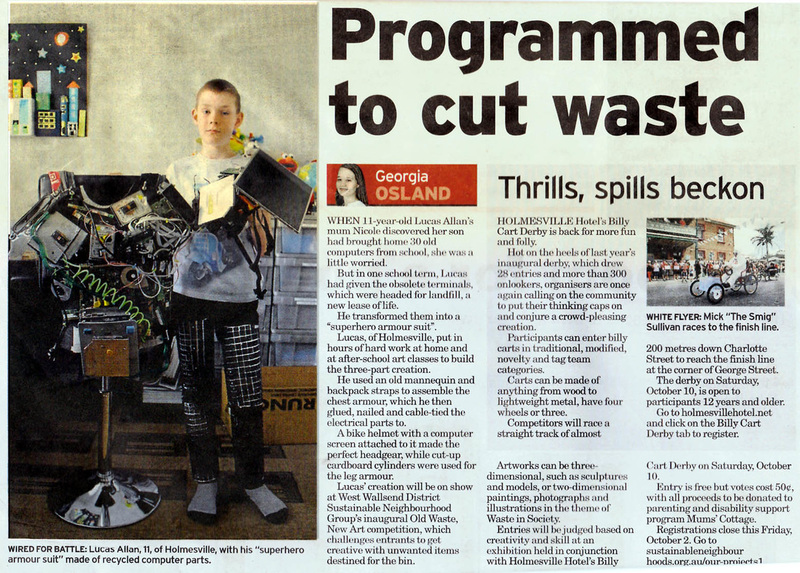 The OWNA competition, held in October 2015, aimed to promote recycling and reuse to create objects of ar, with proceeds of the entry fees being donated to Mums Cottage. Congratulations also to Sister Helen Anne from Mum's Cottage for being nominated for Volunteer of the Year. It was pleasing to see the effort and work by the members and committee of WWDSNG has been recognised in this way. The award was presented to WWDSNG Chairman by Deputy Lord Mayor, Brian Adamthwaite. Newspaper article from "The Star"
A review of the Sustainable Neighbourhood Action Plan (SNAP) was held at our meeting and the following achievements noted and suggestions made on how we can continue our work in the local area.